The last Sunday, February 25, I was lucky to participate in the unique workshop organized by Django Girls. Django Girls is a non-profit volunteer-run organization that helps women to dive into web development. You can learn more about the organization and next workshops on their website. The material of the workshop is very intensive and covers a wide range of topics, such as ORM models and URL mapping. It also introduces tools like GitHub and command line utils. During the training, attendees create their own web applications from scratch and even deploy them with PythonAnywhere.com. The tutorial is available for free here. It covers all steps from installation to deployment. 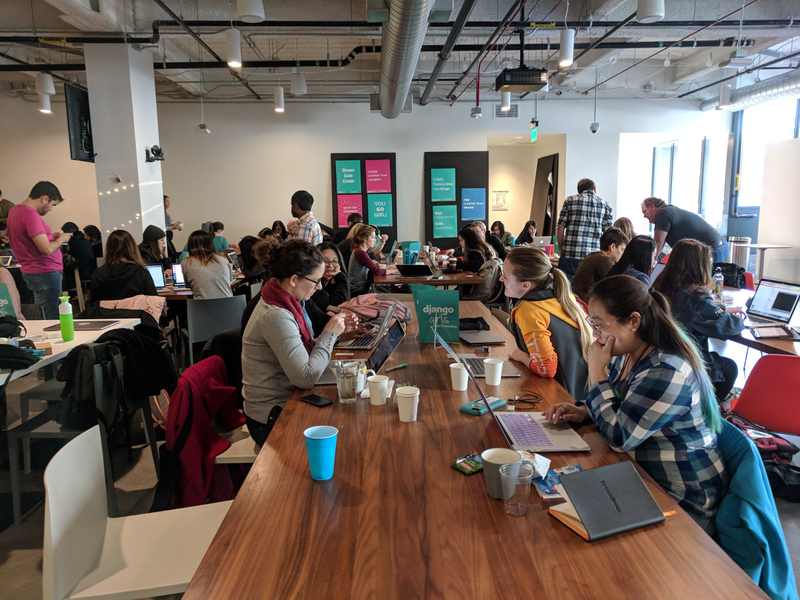 I found out about the Django Girls workshop in San Francisco from a meetup group. The date of the event was February 25, but the deadline for application ended one month before, January 30. Thus, if you want to participate, make sure to apply before the deadline. Next, the number of seats is limited. My friend from college, who also applied, was placed on a waitlist. However, if you are on the waitlist, there is still a good chance that somebody refuses to go. My friend got her spot one week later. Approximately one week before the event, I received an email introducing my group - three other students and two instructors. We set up an online meeting via video chat. The intention of this session is to make sure that you installed all prerequisites for the big day. It is also an excellent opportunity to get to know your teammates. I attended several paid workshops before, but this workshop was undoubtedly the best, and it was for FREE. First, many kudos to the organization and attention to details. Before the day of the workshop, I got few emails from organizers about details of the event. The part that amazed me the most was about transportation. The first time in my life, somebody else did research about the closest parking garages for me. They cared that nobody gets lost and provided detailed information how to find the building. Next, an online installation session with the assigned group helped a lot. Since everybody installed prerequisites, such as virtual environment and Django, before the workshop, we could jump straight to the development. Moreover, members of the group were not complete strangers anymore. Because I talked with my instructors and teammates via video chat, it felt very natural to reunite with them in class. Thus, we skipped the introduction part and had a chance to know each other better. Also, I want to emphasize the friendly ambiance of the event. Usually, my natural shyness enhanced by the fact that English is my second language turns me into a very isolated person. Well, not this time. Not sure how they did this trick, maybe they added something to the ice cream, but the atmosphere seemed so welcoming that for one day I was an extrovert. I even approached unfamiliar people by myself! Wow! Hope, I didn’t annoy anyone. Finally, I want to talk about my favorite part, food. How I mentioned before, there was ice cream. I remember that there were some other snacks, but who cares when you have unlimited ice cream with assorted flavors. Thanks, sponsors! Another astonishing part was the variety of dietary options for lunch. Usually, when I attended workshops, there were two choices — regular meal and vegetarian. However, before the event, organizers sent questionary about dietary preferences. As a result, there were a lot of options, such as gluten-free and dairy free. All these parts of thoughtful organization show that they care about their participants. At the event, I told my friend from college, that I felt very loved. She agreed with my excitement. After this workshop, I feel more confident in my interpersonal skills and probably will not be as shy as before anymore. I had an opportunity to learn something new and met amazing people with diverse background. If you have a chance to attend Django Girls workshop, definitely do it. I sincerely believe that you will not regret.